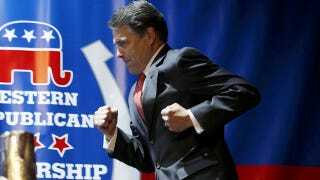 Rick Perry's been saying a lot of stupid crap over the course of the last few days. Between grabbing a stick, running to the field, and eagerly pounding away at the dead horse of the Presidential Birth Certificate Question because it's "fun" and calling Mitt Romney a "fat cat," Perry's been doing some fancy mouth-shooting. But today, he topped himself. But I don't care about that. What I care about is them having the dollars to invest in their companies. To go out and maybe start a business because they got the confidence again because they actually get to keep more of what they work for. If that's what comes, I'll take that criticism. Because what I'm interested in is getting Americans working. There you have it. Rick Perry does not care about income inequality. And "get America working" is code for "tax breaks for the rich." Trickle down economics works! Don't you remember how equal everybody was in the 80's?